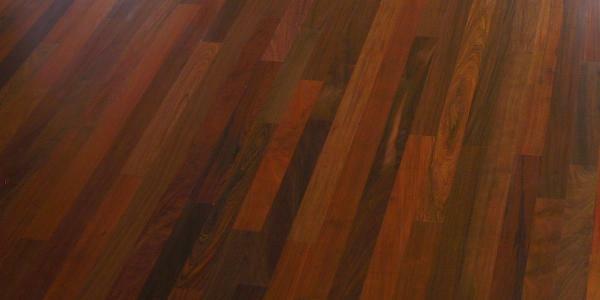 Brazilian Walnut, which is also known as Ipe, has a very beautiful chocolate color. Famous for its durability, Brazilian Walnut is even popular in decking applications, and you can be sure it will provide you amazing durability as a flooring as well. Its beautiful color is breathtaking and is certain to provide any ambience with a warm feeling. For more technical information on this specie click here : Technical Info. We offer Brazilian Walnut flooring both Unfinished or Prefinished. We produce our Brazilian Walnut flooring as well as all our other products at our own mill in Brazil under strict quality control ensuring the highest quality of the products delivered to our clients. As the flooring is produced by us and sold directly to customers, we are able to offer the lowest prices in the market, without compromising the quality of the material. There is no catch - we want to offer our flooring at a fair price to clients which are looking for an exotic flooring. The Prefinished Brazilian Walnut is finished with 7 Coats of Aluminum Oxide enhanced Polyurethane. The flooring is UV Cured and has Anti-Scratch Topcoats..
All of our offered flooring products, are of a Select & Better quality grade, including our rich Brazilian Walnut Flooring. The Quality Grade is the highest available for exotic species. It means the flooring is free of any defects and allows the natural color variation which exotic species, as Brazilian Walnut, present. Our Brazilian Walnut flooring is all Solid, 3/4" thick. We can offer the Brazilian Walnut in a variety of widths, as per our above mentioned price offers. The material comes packaged in boxes with Nested Lengths from 1' to 7' long. The total square footage per box varies according to the width of the material. We have no minimum order size and can attend any quantity required. We can arrange competitive freight rates from our warehouse for delivery to your destination. Please contact us to receive a delivered price quote. We can also ship Directly from Brazil in container loads shipped to your port of choice. 3.25" Wide : $ 5.29 p/sq.ft. 5.00" Wide : $ 5.79 p/sq.ft. 5.00" Wide : $ 5.29 p/sq.ft. * Prices are from warehouse. Please contact us for a delivered price. We can ship the material to any location within the US or Canada. Lengths from 1' to 7' ft.
2) Filler Coat - This coaring fills any open grain and pores to create a very smooth surface. 3) Second Fill - Continues to Build the smooth surface. Many prefinished products do not apply a second fill coat to cut cost. 4) Aluminum Oxide - Provides the hardness and durability of the prefinished process. The most important coat for durability. 5) Sealer Coat - Helps smooth out the Aluminum Oxide coating for the final two coats. 6) Second Seal - Continues to smooth the finish. Many prefinished products skip this step to cut cost. 7) Wet on Wet top coat - First of two top coats provides the scratch resistance by adding additional aluminum oxide creating durability only found with the prefinish process. 8) Final Top Coat - Controls gloss level. We accept any order size. We will prepare the order to attend your exact quantity requirements.